Registration Procedures! Schedules change and we can too. Please e-mail or call 610-459-0330 for any class requests, wait lists, wish list, comments and concerns. Happy Handstands! --All online registrations are pending upon our approval. E-mail confirm will be sent. --The year is molded into 6 sessions based on the school year calendar. Tuition is paid every 6 weeks. A valid credit or debit card is required for registration. All students are automatically enrolled in the same class for the next 6 weeks unless you change or withdraw by the Change Date. The change date comes two weeks prior to the start of the next quarter. YOU MUST TELL US IN WRITING of any change in days,times,class, or if you would like to add a second class, or drop a class. If you are not on the auto charge program, tuition should be paid during the change dates by check, cash, or credit card. If we do not hear from you during change week, we will run the family's "on file" credit/debit card for the current quarter charges. --checks made payable to Garnet Valley Gymnastics. If you check is returned for non-sufficient funds (NSF) , our bank will electronically debit your checking account for the full amount of the check PLUS A PROCESSING FEE OF $30.00. -- A refund is offered only in special circumstances. If a credit card refund is issued, our system will issue the refund less a 20.00 processing fee. --Only the most expensive tuition in your immediate family pays full tuition. 2nd child $10 off, 3rd $15 off, 4th $20 off. --1 makeup per session. Please call or e-mail the office when you miss class. This generates makeup spots in the other classes to help scheduling makeups. --Joining: no problem, your tuition will be prorated. --Dropping: no refunds or credits except with a WRITTEN medical authorization. --Changing: no problem, as long as there is space available. --Set up your family account at anytime online. - On-going enrollment, based on class availability. -- You may register in person or online. If your class selection is full, you will placed on a waiting list and you will be notified when there is an opening. In consideration of allowing the previously-declared participants(s) to begin in Garnet Valley Gymnastics center activities, while on the premises and property of said Center, the undersigned, for themselves, and/or being the legal and acting guardian of the participant, acting for themselves and on behalf of the participant, release and hold harmless Garnet Valley Gymnastics, a Pennsylvania Corporation, its owners, officers, employees, and agents of and from any and all liability, claims, demands, and causes of action whatsoever, arising out of or related to any loss, damage, or injury, including death, that may be sustained by the participant and/or the undersigned, while in or upon the premises upon which Garnet Valley Gymnastics Center is conducted, or any premises under the control and supervision of Garnet Valley Gymnastics, its owners, or agents or in route to or from said premises, or while at any premises or place when activities sponsored by or participated in by Garnet Valley Gymnastics, its owners, officers, agents, or employees. b) That the undersigned signing for themselves, or as Legal Guardian is, in fact, the true and legal guardian and has the consent of the participant. The undersigned gives permission for the Garnet Valley Gymnastics owners, employees and/or agents to seek emergency medical treatment for the participant(s) in the event they are unable to reach any parent or guardian. The undersigned also agrees that they themselves will be responsible for any debt incurred by said action. 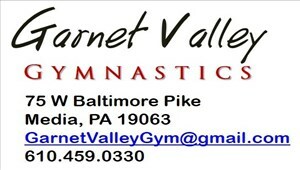 Occasionally the Garnet Valley Gymnastics Center uses photos or video of its students in print ads, on its web site, or other marketing mediums. I understand that my child's likeness may be used in such advertising. These images will be used for Garnet Valley Gymnastics purposes only, and will not be given or sold to outside companies or individuals. I have read and understand the above Assumption of Risk and Release of Liability and Medical Release and Marketing Release. In addition, I confirm that I am the parent/legal guardian of this registrant(s).